Digital Sketchbook is an event open to all, held as an open studio and rehearsal space to test out ideas and show work in progress and developing artistic process. 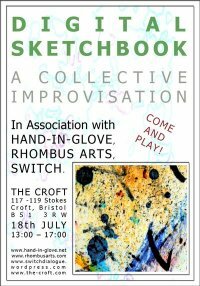 The public are invited to come and collaborate with Bristol based artist collectives Hand-In-Glove; Rhombus Arts; and Switch. 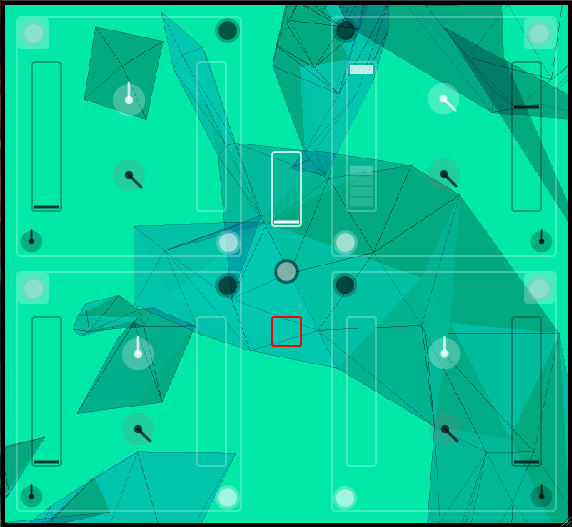 Digital Sketchbook is a multi-disciplinary forum with the aim of collaborative improvisation: a multi-media jam session involving moving-image, photography, music, painting and dance. Digital Sketchbook is a place to try out ideas and collaborate with others as opposed to presenting a devised performance. The public are invited to come and see ideas develop and change throughout the session. Follow the Karman Cube on Vimeo. Here you’ll find all the latest developments from Jamie Thomas and the non-tangible spinning cubes. Spotify Playlist – Voco Oh No! Here’s a music treat for you. 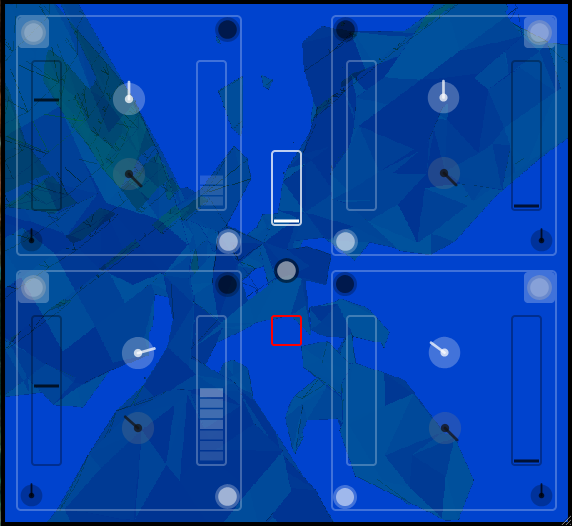 Today we received a specially selected playlist from sqwrk, the guest DJ for Dialogue 2. His set focussed on music that uses vocoders prominently, and this new playlist makes the cream of the crop available to you for free. Featuring plenty of quality music from a diverse range of artists, this is not to be overlooked. Thanks to Spotify, listening to this music is free and totally legal to share! P.S. We’re not in cahoots with Spotify. We simply love the convenience it offers us, and think you might like it too. Enjoy! Tags: Keir Doherty, Playlist, Spotify, Sqwrk, Voco Oh No! 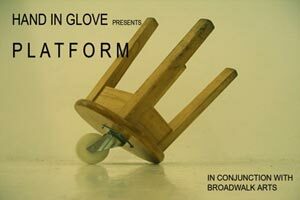 PLATFORM takes place between Tuesday 9th and Saturday 13th June at Broadwalk Shopping Centre in Bristol, with a Preview night on Monday 8th June from 6 – 8pm, and is open to all. A selected group exhibition of current and recent art graduates, showcasing young and emerging artists who represent an eceletic range of contemporary visual media. We aim to provide opportunities for exhibiting and networking for other like-minded artists, enabling them a stepping stone to involve themselves with the Bristol art scene. Hand In Glove seeks to engage with artists that are in the midst of the transition from further education into professional practice, easing this often difficult process. The exhibition is motivated by a DIY approach for artists to get their work seen, with the intention of raising creative profiles and generating opportunities for those involved. This is a free event and we welcome all members of the public to attend. The exhibition is open Tuesday 9th to Saturday 13th June between the hours of 12 and 6pm daily. We’re happy to announce that the next Dialogue (Tuesday 2nd June 2009) will be streamed live by our friends at radiovague.com. So, if you’re unable to make it down to the event itself, you will still be able to listen to the performances. Simply visit the radiovague website, and click Dialogue. Audible Fields is an evening dedicated to the art of listening. Performances will run alongside films, amplified objects and field recordings within the darkened auditorium of The Cube Microplex, Bristol, UK. An artist-led networking and information sharing evening, presenting a series of collaborative live and recorded performances and installations by local visual artists, sound artists and musicians. The night is open to all with a focus on showcasing local creative talent, meeting new creative people and allowing a platform for promoting your own arts events and exhibitions. INTERPLAY is an opportunity for all creative people based in the Bristol, South Wales and South West area to meet and develop an inclusive and evolving network where new collaborations are formed, new contacts and friendships are made, and new art is shared. The night is FREE to attend and open to all, but particularly aimed at practicing artists, creative practitioners, art, film and performance students and anybody with an interest in and passion for innovative contemporary arts.